Practical, visually attractive, wider and more open than ever before, the industrial office design aka ‘industrial look‘, garage aesthetic or warehouse styled office design has gained prominence over recent years. This trendy alternative design aesthetic for modern workplaces is now considered synonymous with brave and bold, innovative and organic organisational structures. What used to be building façade and concealed structures are now proudly exposed. Structural elements are turned into showpieces, achieving a look that seems unfinished, yet come across as cohesive and chic – baring it all and displaying all that lies beneath for a raw and edgy finish. This design philosophy is about combining superfluous with utilitarian, wood with metal, contrasting the interplay of form and function and elevating humble materials into art pieces to achieve cold, yet comfortable, workspaces. But what is it exactly? What does it mean when clients say ‘I want an industrial look’? 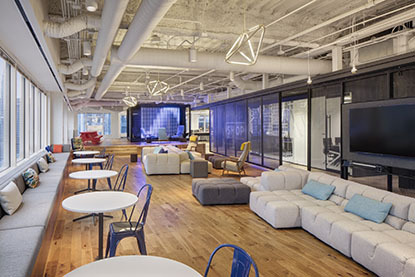 Below are some key design elements of the industrial office design as popularised by the offices of Twitter, Google, Redbull, and Capital One. 1. Exposed pipes, beams and ducts. The first signature element of every industrial looking office and has become a very popular interior design idea among those who want to achieve the ‘unfinished’ and raw look. It is a smart and bold move and a great choice for all-white spaces. Bright walls offer a fabulous contrast to metal piping, providing, even more, light to the room and making it look visually bigger. This look perhaps resulted out of necessity, as designers sought to convert old or abandoned warehouses, factories and barns into spaces conducive to urban consumption. This design style celebrates engineering and mechanical ingenuity and presents an interesting opportunity to juxtapose the raw with the refined, the sleek and modern with the vintage and classic. Practicality meets creativity, with the added benefit of effectively eliminating the cost of covering all exposed features. 2. Wood over Metal and Vice Versa. 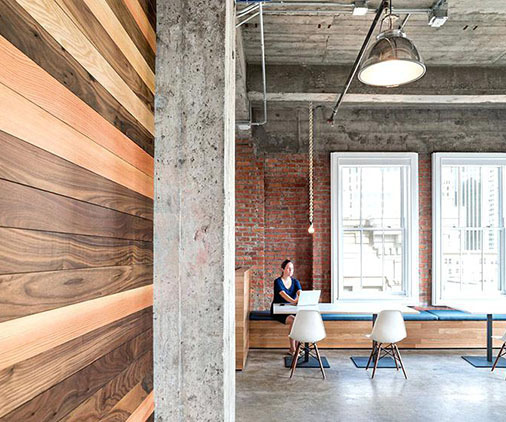 A profusion of wood and metal surfaces are showcased in nearly every industrial-style interiors. This beautiful textural interplay of grainy, earthy wood versus the smooth, lustrous metal is what leads many to first consider industrial chic. Many attics and old buildings and factories come with a wall of brick or concrete. With industrial interior design, these can become amazing features when space is re-styled or repurposed. Bricks and concrete features such as eye-catching accent walls really stand out and provide great conversation starters with clients. The more worn, the better. Concrete is a fabulous and economical choice for the industrial interior design look. It can be polished to a high gloss or left matte or unfinished for a more rustic appeal. Leaving nail heads and seams exposed pulls off the industrial chic. Concrete is also very versatile and can be used for floors, countertops, sinks, bathtubs, fireplaces and lots more. Warm, neutral colours are generally favoured for large and open spaces. Such hues help to bring visual warmth to an area that might otherwise be overwhelmed by the coolness of metal pipes and ducts. Earth tones of green and brown work well, as do shades of grey. 5. Balancing it all with Lighting, Furniture and Accessories. The ‘warehouse look‘ requires careful considerations when choosing lighting, furniture and accessories. Vintage and/or classical pieces work well here, offsetting the cold, bare features of the building. Plush couches, plants, scatter cushions, rugs and even bean bags are the order of the day as you take your space a notch further to bring warmth to that cold contemporary industrial design feel. The industrial style interestingly takes many forms, flexibility is key – as there’s no one size fits all. 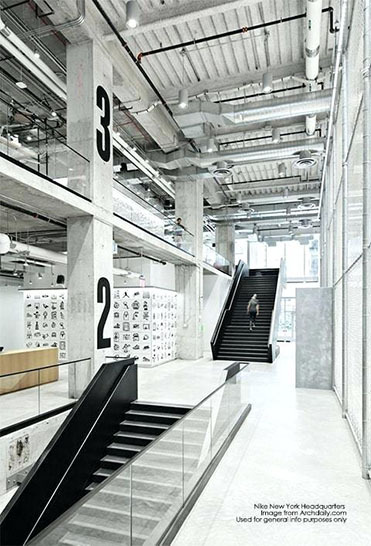 Keen on learning more about industrial office design today? Contact Wurkspace7.